He lives in Kwun Tung. Two minutes from a swanky mall. Eight flights of steps above a used cellphone shop. Hard to understand why he’s stayed so long. Thirty years. We look at his home, struggle to comprehend. 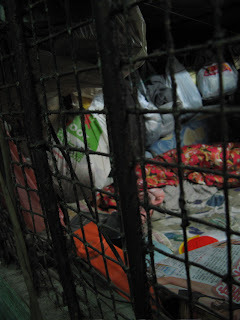 30 years inside one of Hong Kong’s notorious cage apartments. The space is also much emptier now. More than a hundred people lived here three decades ago. Stacked up in cages inside a 1000-square-foot space. 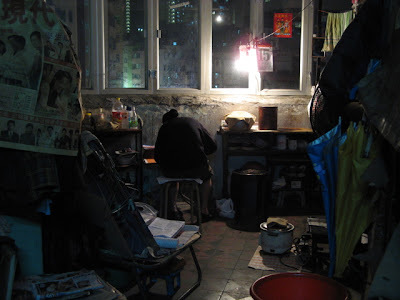 It is still the cheapest accommodation you can find in land-scarce Hong Kong. A space to sleep in at night and hold your belongings in the day. Only nine occupants remain today. They’ve been forced to share so much, yet know so little about each other. We ask him about his neighbour – a man who’s literally slept next to him for the past 20 years. He shrugs, shakes his head. “Don’t know. Ask him yourself,” he says. He’s stopped locking up his cage. Has even removed the wire mesh. His things now spill into bunks that once housed other people. Life is much better now that everyone has a bit more space. But he too, will be leaving soon. Moving into a government flat. Moving on, after 30 years. He snorts when we ask if he’ll miss his current home.